Giovanni Antonio Boltraffio (ital. Giovanni Antonio Boltraffio; 1466 or 1467, Milano — 1516, ibid) — Italian painter of the High Renaissance. The artist came from an aristocratic family. Reared in the traditions Poppy, Bernardo and Ambrogio Zenale Bergognone, he was trained in the workshop of Leonardo. His first work "the Resurrection of Christ, St. Leonard and St. Lucia" is made in 1491, together with Marco d Oggiono to Milan's Church of San Giovanni Sul Muro. Was court artist to Lodovico Moro and was famous for his psychological portraits. Boltraffio, died at the age of 49 and was buried in the cemetery of the Church of SV.In Paula Comito. 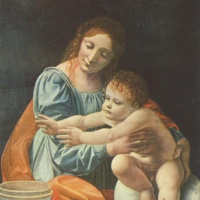 Some critics suggest that the figure of the baby in the painting of Leonardo da Vinci "Madonna Litta" written may, Boltraffio. paintings (Milan, Museo Poldi Pezzoli), which is surely the most talented interpretation levandovskaia.